Busy B Family: Easter Happenings! These are a few pictures from last week while it was so nice outside! The past 5 days have been miserably windy, i'm so over it. Today is supposed to gust to 60 mph. Oh boy, doesn't that sound fun! Anywho... These are Landry's daisy dukes! hehe, I think they're so precious on his little legs! He's built like my granddad was, short legs and long torso! Big daddy wasn't real impressed with them, but I thought they were cute! This one cracks me up, they're both making the same face! Two little pea's in a pod those boys! This kid is obsessed with dipping his food in something. At this point his favorites are ketchup and ranch. And let me tell you, he usually eats more of it than his actual dinner! How was y'alls Easter celebrations? Ours was not so good. Landry hasn't been feeling good for a few days and it all crashed on us on Sunday. His fever when we got home from Easter was 102.7 and he still had a 101 on Monday morning. UGH. This is Landry opening his Easter "basket," he got bubbles, sidewalk chalk, bath toys, a walking chick, and some suckers and candy! We went to my parents house first for lunch and an egg hunt. Landry was pretty crabby the whole time we were there. Daddy helping him with his eggs. Then he had to get Grampy's help too. After he found all his eggs, he decided to donate them to Keevan's basket! Trissa got Landry a marshmallow sucker and some little candy's for his Easter present. He thinks the marshmallow is awesome! Then we headed over to Chris' parents for a few hours to celebrate with his family. We stopped by the cemetery to put fresh spring flowers on my great-grandparents graves. I think they are really pretty! Landry and Collin hunting their eggs. Landry ended up with 2! And this is what it's like trying to take a million grand/great-grandkids pictures at one time! This is about the best one out of about 10 that I took. 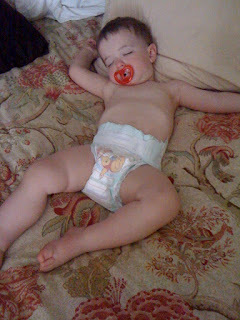 Landry cried almost the entire way home from there, so when we got home he got to pretty much do whatever he wanted to! Of course he ended up out back to play with his new bubbles and the water! Uncle Terry came over and helped Big Daddy move Landry's crib to his new room Sunday evening so we can start working on the nursery. His new room is no where near complete, but the walls are painted, so we wanted him to get used to sleeping in there. He decided he wanted to play on daddy's computer, so daddy had to show him a picture of Jennifer Aniston, which I think Landry liked! This is the north wall in Landry's big boy room. We're (and by we, I mean Chris) going to paint a little bit more on the brick wall to look like a fire station and then decorate in a fireman theme! I'm really excited to get it finished! Landry and me stayed home yesterday and he went to the pedi. Turns out he has a sinus infection, and ear infection in his right ear and severe allergies. So he's taking a steriod, and antibiotic and a cough medicine! We're all just hoping he isn't allergic to the new antibiotic. I hope the little man feels better really soon, I hate when he doesn't feel good. It just breaks my heart. Then you wonder why I HATE the wind. stupid allergies. This is the video of Landry hunting his eggs at my parents house, it's kinda long. Hope everyone enjoyed celebrating Easter with loved ones! Cute pictures. Sorry Landry was sick. Next year I bet he gives the big ones a run for their money on finding the eggs. He loved watching the video and "talked" while pointing at the screen. I enjoyed a wonderful Easter with the family with good food &egg hunt, happiness and fun.It was a pretty day to celebrate Christ and give thanks for my family. Love you all. The pictures of you and Landry are so cute! You look beautiful! I can't wait to see nursery and big boy room pics. Glad y'all had a good Easter and hope Mr. Landry feels better soon.